Which is the best zoom lens upgrade for your DSLR camera? Standard zoom lenses are the ones that most of us use for the vast majority of our shooting. The zoom range of around 18-55mm translates to a focal length of about 28-80mm on a typical DSLR, thanks to the crop factor of an APS-C sized sensor. This provides a generous field of view at the wide-angle end, stretching to decent short telephoto reach at the long end, ideal for portraiture or for getting that little bit closer to objects in the middle distance to help us get a perfect shot. Considering that a standard zoom is such an everyday lens, it pays to use a good one. 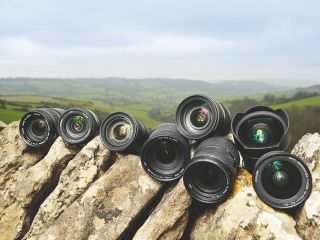 And you can't help thinking that the kit lenses supplied with most cameras are built down to a price. Without wanting to pick on anybody in particular, let's take the Canon EF-S 18-55mm f/3.5-5.6 IS as an example, which is supplied as a kit lens with the Canon EOS 550D. The Canon EOS 600D has the new II version, which is supposed to be optically the same. Considering the wealth of features and technical prowess of these cameras, the kit lens looks like a bit of a mismatch. It also feels cheap and plasticky, right down to the mounting plate, which is made of plastic rather than metal. Furthermore, it lacks Canon's refined USM (UltraSonic Motor) autofocus system, and the front element rotates while focusing, which makes rotation- specific filters such as polarisers and ND grads a pain to use. At the other end of the scale, pro-level standard zoom lenses such as the Nikon AF-S DX 17-55mm f/2.8G IF-ED can be expensive at over £1,000. These lenses are often big and heavy as well, making them feel a bit unbalanced on relatively lightweight bodies. Thankfully, there are plenty of options that bridge the gap between cheap kit lenses and professional exotica to choose from. One of the features that's usually taken for granted on professional standard zoom lenses is that they're 'constant aperture' lenses. You can expect a fast maximum aperture, typically f/2.8, which is available all the way through the zoom range. When you're shooting with studio lighting or in manual exposure mode, it's a real bonus to know that your maximum available aperture won't decrease from, say, f/3.5 to f/5.6 as you zoom towards the telephoto end. The Sigma 17-50mm f/2.8 EX DC OS HSM, Tamron SP AF 17-50mm f/2.8 XR Di II VC LD Aspherical and Tokina AT-X 16-28mm f/2.8 PRO FX lenses all have a constant maximum aperture of f/2.8, while the Pentax smc DA 16-45mm f/4.0 ED AL has a constant maximum aperture of f/4. The downside is that the zoom range itself is relatively modest at between 1.75x and 2.9x. By contrast, the Canon EF-S 17-85mm f/4-5.6 IS USM, Nikon AF-S DX 16-85mm f/3.5-5.6G ED VR, Olympus Zuiko Digital 14-54mm f/2.8-3.5 II and Sony DT 16-80mm f/3.5-4.5 ZA Vario-sonnar T* have a greater zoom range of between 3.9x and 5.3x, but the maximum aperture shrinks by about a stop as you zoom from wide-angle to the telephoto end. Another bonus of having a fast f/2.8 lens is that many cameras can take advantage of the increased light transmission to enable more decisive autofocus in dull conditions. This is because the central AF point often has a higher sensitivity rating, which boosts performance when coupled with lenses that are f/2.8 or faster. Autofocus itself is often faster and quieter than with basic kit lenses. The system fitted to the Canon lens in the group is based on the upmarket 'ring-type' ultrasonic motor, which comes with full-time manual override for preferred adjustments, unlike Canon's more basic micro-motor or standard USM systems. This is great for tweaking the focus setting after autofocus has been achieved without having to switch between autofocus and manual focus modes which can cost you precious time. The AF-S (Silent Wave) system fitted to the Nikon lens on test offers the same range of trickery. Sigma's HSM (HyperSonic Motor) on its 17-50mm lens is also quiet, but it lacks the full-time manual override featured on some of Sigma's HSM lenses.